The use of Blender as a tool for architectural visualization may fulfill several different types of stages of a project. From an artist point of view, you will find interior visualization and realistic renders to be one of the most common outputs. If you work with architecture development, you probably know that a visualization like that is one of the final stages of a project. You already have a well-developed idea and want to present that to a potential client. But, until you reach that point you must pass through a lot of steps. The very first step for most projects is a site analysis. How does the terrain look? A flat ground will give you a lot of freedom to create. When the terrain is not that flat, you probably will have to shape the project to fit that terrain. A terrain analysis is a necessary step to start a project and is among the first things you learn to do in architecture. Can Blender help us to do terrain analysis? Sure! 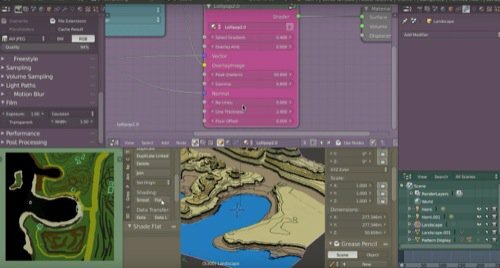 Here is an interesting resource for anyone that wants to use Blender in the initial steps of the development, which is a unique material for topographical analysis. With the material, you will be able to sculpt a terrain and have elevations, and level curves highlighted. You can either take the graphics to discuss with your team or use it to plan how to shape a potential building. The material is available to download in BlendSwap and was a creation from artist shadowphile. It has a Creative Commons by attribution license. Follow the link to the page, and you will also find a tutorial showing how to use the material. It may not be a full GIS solution, but it can extend the use of Blender not only as a tool to appear by the end of a project. Do you want to go further and integrate Blender to the development of a project? Take a look at our course about technical drawing with Blender. You will learn how to render technical drawings using only Blender. What about 3d terrains? For that, you can also check the course about architectural modeling with Blender, which has a lesson dedicated to terrain modeling.